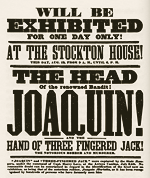 The preserved head of Joaquin Murieta and the hand of Three-Fingered Jack were sold at auction today to settle their owner’s legal problems. Joaquin Murieta was a notorious and romantic figure in the early history of California. With Jack, his right-hand man, Murieta led a gang of Mexican bandits through the countryside on a three-year rampage, brutally “liberating” more than $100,000 in gold, killing 22 people (including three lawmen), and outrunning three separate posses. After posse #4 tracked him down and chopped off his head — or at least the head of someone who might possibly have maybe looked like him — Murieta’s story entered California folklore. The backstory-legend of the man known as the “Mexican Robin Hood” sprouted from a fictional account written after his death. This novel spun the tale of a Mexican nobleman whose wife was raped, brother hung, and he himself horsewhipped by a group of white miners — and a racist court system which allowed no Mexican to testify against them. Murieta vowed to avenge his family’s dishonour himself, and with a small group tracked down and killed all six attackers. Since this act had turned his gang into outlaws, so the story goes, a life of crime was the natural consequence. Murieta’s head, preserved in a jar, became a lucrative public attraction, until the public’s fancy turned to other affairs. While alive, the reward for his capture had risen as high as $5000. At auction, the pickled head of the outlaw brought a mere 36 bucks. The 1000 block of Lombard Street, which famously claims the title of “crookedest street in the world”, was once rarely used, straight as an arrow, paved in cobblestones and climbed Russian Hill at a startlingly steep 27% grade! In 1922, a man who owned several lots on the block proposed the switchback design to make the street accessible to automobiles, and raise his property values. The city of San Francisco spent $8000 on the project, requiring property owners to pay for the fancy brick steps that run along the verge, to maintain the spectacular plants and flowers in the median and to install and maintain light fixtures. The newly crooked street opened this week in 1923 — but it didn’t become a tourist attraction until the early ’60s, when a photo of the street (flowers in full bloom) appeared on a postcard. Hundreds of thousands of copies were sold, and the rest is history. 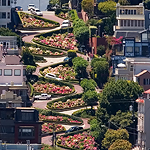 At the risk of creating a new tourist mecca, I will reveal what many San Franciscans already know — namely that the crookedest street in the world is not Lombard at all, but the steeper and crookeder (crookeder?) 800 block of Vermont Street on Potrero Hill. 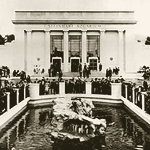 On the same 1923 day as Lombard Street opened across town, the Steinhart Aquarium in Golden Gate Park opened its sculpted bronze doors to the public. For the next thirty years, it would be the most outstanding aquarium in Western North America. Ignatz Steinhart was a wealthy entrepreneur, and, I presume, a great lover of fish. He donated the money to build the place in honour of his deceased brother Sigmund. The aquarium was designed by San Francisco architect Lewis Hobart, known for a couple dozen other little projects such as the Bohemian Club, Grace Cathedral, and that fabulous Union 76 clock tower at the foot of the Bay Bridge — the one destroyed by Bank of America back in the ’90s. 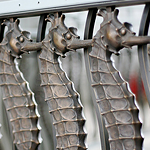 Everybody’s favourite part of the aquarium was probably that gorgeous bronze sea horse railing around the alligator pit. That railing, along with the doors, were sculpted by San Francisco artist Edgar Walters — also responsible for the beautiful sculpture above the entrance to the PG&E building at 245 Market Street. Interestingly, after a 4-year rebuilding project which saw the Academy temporarily relocated downtown, the whole California Academy of Sciences will re-open in Golden Gate Park on September 27. That’s this very week, exactly two days short of the 85th anniversary of the aquarium’s original dedication. C’mon, couldn’t they have waited two days to make it come even? Wow! Your Podcast is simply the best, thanks for your work! Severed heads? Are you sure this isn’t the week of Oct 31st? I love the new timecapsule podcasts… Just the thought that I’ll get a new Sparkletack in my iTunes every week made my day! Of course I hope that we’ll still get a new full-featured episode every now and then… I missed the podcast a lot over the last few months. @EB: I’ll have to scrape up something especially narsty for Halloween, just for contrast! Finally something to bring me back to podcasts.. Thanks so much! 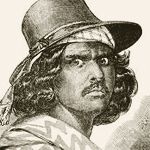 Joaquin Murieta looks like an angry “Weird Al” Yankovic in the image. "This is a fantastic website! Thank you sincerely. It is just the type of thing that brings the past to life and personalizes the city making it a joy to live in."